Tick season is fully upon us, and it is not just people living in the woody areas of the country that should take precautions against these blood-sucking creatures. Sure, they love the woods, they love dogs, and they love tall grass, but they are also learning to love city life. Knowing how to prevent, diagnose and treat tick bites is pertinent information, not just for those that live in the country. Lyme disease was first described in 1977 as “Lyme arthritis,” and is now the most commonly transmitted critter-vectored disease in North America. Each year over 30,000 new cases are reported, many in areas where no previous infections have been recorded before. Lyme disease is on the move, slowly pressing towards more populated regions. For this reason, city dwellers should not consider themselves safe from the threat of these pesky critters. Why bother, you may ask, to worry about a teeny, tiny little tick? Well, the stakes for ignoring these small but highly dangerous insects can be huge. Lyme disease is caused by the bacterium Borrelia brugdorferi and is carried by deer ticks or black-legged ticks. Deer and white-footed mice often serve as reservoirs for this bacteria. It is the small ticks that matter most; the juvenile ticks, which are only slightly bigger than a period at the end of a sentence, are the most dangerous. 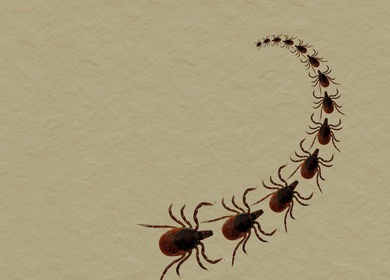 According to an ongoing study that investigates diagnosis of Lyme disease, most prominent textbooks and websites feature a bulls-eye image rash pattern. This has become sort of the hallmark symptom of the disease. This misinformation could lead to a misdiagnosis and lack of treatment. Even more disturbing is the fact that not everyone with Lyme disease actually develops a rash. Symptoms of Lyme disease that may not appear until weeks, months or even years later include arthritis, numbness and pain and irregular heart rhythm. Early diagnosis can prevent long-term complications that do not always respond favorably to antibiotics. Some people can develop chronic Lyme disease which can interfere with their quality of life. Although you could spray yourself with a chemical repellent, healthier options exist. Pour the coconut oil into the small bottle (liquid form – heat it slightly if needed). Add the aloe vera gel and shake until the oil and aloe vera mix. Add the essential oils and shake again for about 30 seconds. Apply before you go outside. Next articleTolerating Toxins: Should We or Shouldn’t We? Hey Buddy!, I found this information for you: "Beware City Dwellers: Ticks Moving In". Here is the website link: https://www.thealternativedaily.com/beware-city-dwellers-ticks-moving-in/. Thank you.